Channel your inner pop star, get up on stage, and belt out your favorite rendition of all the classic hits at any one of these karaoke bars in New Mexico for an evening of musical fun. You’ll be the king of rock ’n roll for the night. There’s a little something for everyone at this local pub—good food, good service, good music. Thursday night customers and would-be rock stars can sing, and dance their hearts out on stage to an understanding audience. Be sure to pick a song that everyone can sing along to for the optimum success. A variety of craft beer on tap from multiple local breweries paired with a menu that has everything from pizza to salads to sandwiches makes this small town bar a great place to hang out. 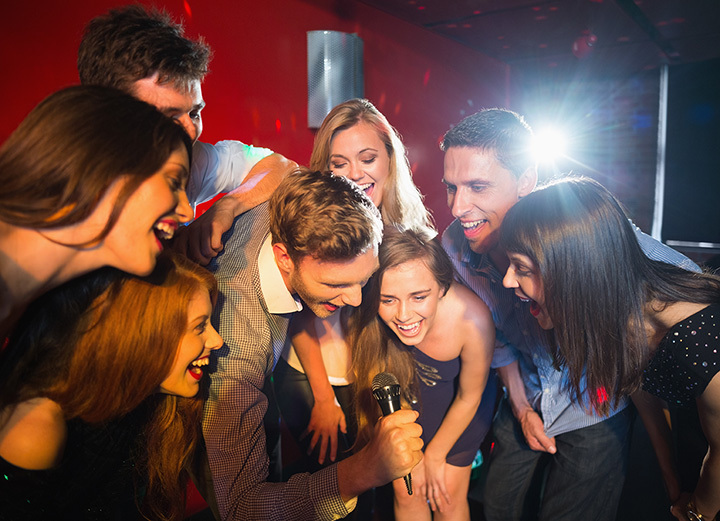 Host a karaoke party without having to do anything more than invite your friends to Dublin’s on a Wednesday night. Everyone can sing to their heart’s content from 8 p.m. until closing. You can also get your fill of Shepherd’s Pie or fish and chips at this Irish-style pub. Bar drinks run the gamut from Irish coffee to margaritas. Karaoke night features The Weenie Wednesday Menu—of course there’s a New Mexico hot dog, as well as an Irish one. Chill out playing games or at one of their theme party nights, too. Head on down to Tiny’s for a high-spirited evening of karaoke entertainment. The karaoke hosts entice and cajole people to come up on stage for their singing debut … or perhaps swan song … at the state’s only certified and licensed karaoke venue for Sound Choice Karaoke. This locally-owned and family-operated business has been around since the 1950s. Named “Best Karaoke in Santa Fe” by the Santa Fe Reporter’s People’s Choice Awards. Karaoke happens on Toby Tuesday with host Toby spinning the LPs, metaphori-cally of course, for the assembled soon-to-be musical mega-stars. The fun begins at 9 p.m. and ends when the last person sings. Cash prizes are awarded to favorites. This is New Mexico’s longest running gay bar and promotes a little bit of country and a little bit of rock and roll, as well as bingo and retro dance nights plus pool competitions and drag shows. This dining place has served locals and visitors for more than 50 years. It was remodeled in 1997 but has maintained its old west style and atmosphere. Karaoke night, Friday in the bar, brings locals and visitors together in the camaraderie of letting loose and belting out favorite songs, solo or in unison. The menu is varied, the staff is friendly and the audience forgiving. On Monday and Tuesday DJ Pete encourages songsters to take a step outside their comfort zone and sing in front of a live audience. The festivities begin at 6 p.m. and go until 9 p.m. After that, no minors allowed but DJ Pete keeps the music playing until closing. The restaurant serves a good mix of American fare with a New Mexico style. Well drinks, beer and wine served in the bar. You can belt out show tunes or any other tunes seven nights-a-week here. It bills itself as the “Home of the Original Rock & Bowl” since it’s really a karaoke lounge masquerading as a bowling alley. There’s a good song selection, an engaging DJ and plenty of good will to make the experience a blast. There’s a wide-ranging selection of beer available with daily specials and a snack bar that serves burgers, pizza, wings and a lots of fried food favorites. White Sands Missile Range is known for a lot of things, but who would of thought there would be a karaoke hot spot nearby? Every other Friday night, beginning at 8 p.m., at the Sparetime Lounge, part of the Roadrunner bowling alley, you can sing along to a wide-ranging collection of songs. Grab a drink from the well-stocked bar and some food at the grill and make some beautiful music. This is a first-class karaoke spot with a state-of-the-art Karma Karaoke System that showcases Luv2sing software which allows participants to sing right from their seats using smartphones or tablets. Wow! No books. No paper. You don’t really even have to get up on a stage. The speaker system is top-notch too so the entire restaurant can hear you warbling. The singing party begins at 9 p.m. and doesn’t stop until 1:30 a.m. on Friday and Saturday nights. You have to be 21 to get in on the fun. This is a place that loves throwing parties. They throw a karaoke one on Thursday, Friday and Saturday nights from 9 p.m. until the last pop diva sings. The one caveat is no singing on UFC Fight Nights. Burgers and sandwiches and a varied selection of appetizers are served for lunch and dinner. Bar is fully-stocked, plus draft and bottled beer. If you don’t like the singers, there’s a place to throw darts at the back of the bar.